Tearing up carpet is much easier than I originally anticipated. 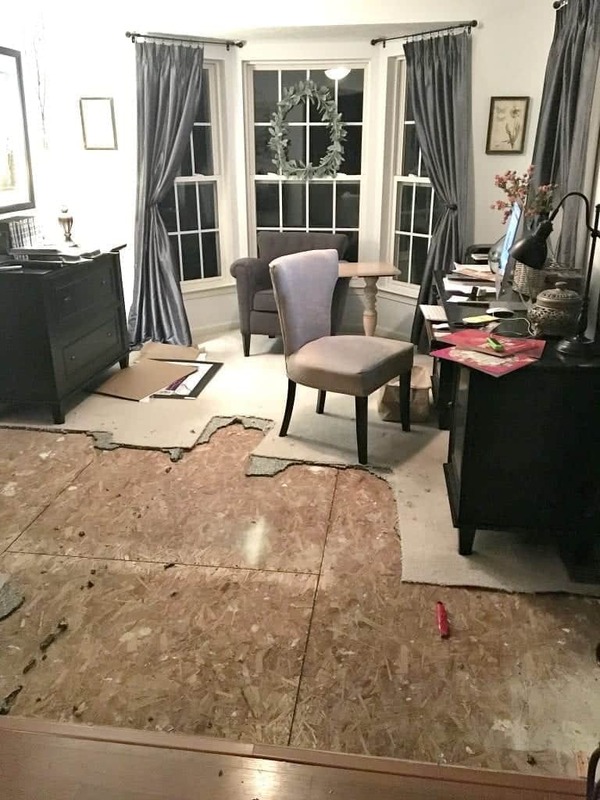 In this post, I’ll explain a bit about why we are removing our carpet, the tools you need and some insight into the crazy life of having a dog with behavioral issues. Welcome to my real life, the one where I’m not in control at all and I occasionally snap. Well, last night…I snapped. Being a home decor and DIY blogger has encouraged better habits in my whole family. I love to see my kids working hard to put their things away, keeping up with their laundry, taking turns with the dishes. But lately, I can’t keep up. We have one non-compliant family member, one that could care less about the blog – my mental health…nor the condition of the house. And he never will. I think I’ve mentioned a few times that Buddy has behavioral problems. The problems are big enough that his previous owners gave him up. He’s tough, admittedly, and we are in a constant state of establishing who is “alpha” in our house. I’ve talked to trainers, breeders and tried leash training, late night walks. But evidently I’ve lost my “alpha” status with him, and I will need to re-establish that pronto. The kennel where I adopted him said “he’s too smart for his own good” which I now interpret as well-timed behaviors that are on purpose. And sometimes it feels like he is downright vindictive when we leave the house. This was no accident. This is alpha behavior. We had just let him outside prior to leaving. We’ve been testing him to see if he can handle short jaunts outside of his crate. I guess not. As you can see, I didn’t handle it well. See, this has been going on for the better part of the seven years we’ve owned him. This. Is why he came with a seven day free trial prior to me adopting him. And this exact spot is where he does his business whenever he’s feeling “alpha” again — a highly visible spot that you can see as you enter my house. But the important thing is…I feel better just taking control of the situation. And, Buddy remained unphased. We are in a constant state of training and retraining here. He chose us…and our carpet as his home. It’s 11 years old and was the lowest grade carpet that came with the house. It’s been spot treated and cleaned numerous times (about 2-3 times per year with a Rug Doctor). Scotchgard doesn’t work well when you have a dog that’s determined to make a statement. We didn’t upgrade because…carpet tends to get gross no matter how high-end it is. So we stuck w/ it until we were ready to replace it. 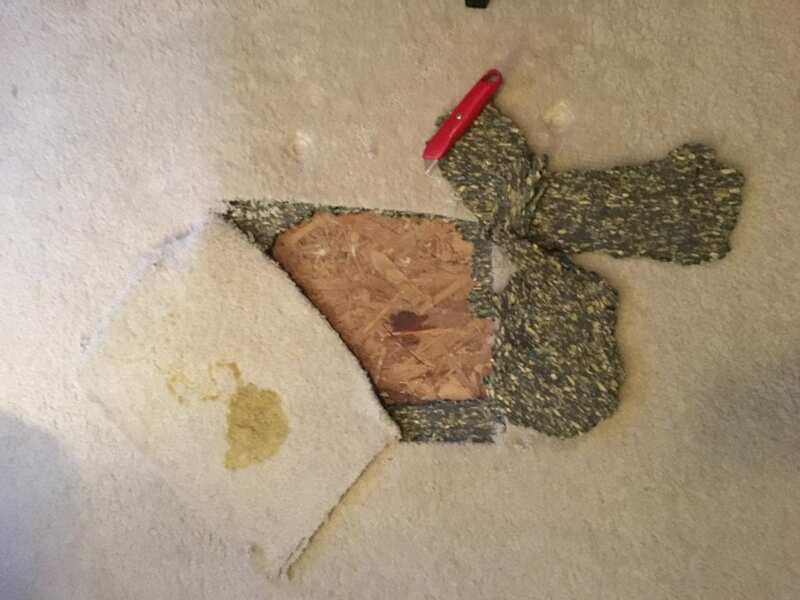 I honestly could try to spot treat again, but there are only so many times this can happen before the carpet (and possibly the subfloor) just has to go. So in the middle of having my kitchen only partially finished — we are now knee deep in another project. As for Buddy, he’s going to have to be placed in his locked kennel with a bone anytime we leave. (He also knows how to escape his kennel…which is awesome). But the house already feels cleaner. And I feel slightly more in control of the situation…even if I’m not. Be sure to subscribe to Facebook, Instagram and Snapchat (find me @snazzythings), you’ll have the chance to see live video of the progress we’re making. I’ll also be providing a YouTube video with a full walkthrough of our house before a full-carpet replacement. There will be lots of before + after as well as in-progress pictures. See you, live and online! I saw this on IG last night! I so feel your pain. We tore up the carpet 3 years ago upstairs for many of the same reasons. I am just now, as in TODAY getting new flooring put in up there. Naughty dog. You are getting lots of heavenly brownie points for keeping the dog that is too smart for his own good. Cindy, isn’t it SO hard? Normally I am so diligent and clean up immediately when this happens…but he’s doing it so frequently I give up! What’s strange is…he won’t do this at all on our laminate. Only carpet!! UGH! So that’s why we’re going this route. Boy Jeanette, we have a lot in common! I’m the same type of person that is something goes wrong I try to handle it right away DIY style. Case in point, my husband replaced a broken garbage disposal but failed to take the part out for the dishwasher so every time the dishwasher would drai , it drained on the counter. Laminate backsplashes do not do well with a week of water being flooded on them so they turned to mulch. I quickly ripped them off and stuck up my marble backsplash that I’ve been waiting for a professional to do. But the other thing we have in common, the destructive dog! We had Max for six years. Had. My husband couldn’t take it any longer and put him on Craigslist. I really didn’t want to see anything bad happen to him so I contacted a rescue for his breed d they took him in. He’s about to be adopted. But Max was like your pooch.very destructive.We have half a couch because he chewed up the back cushions so badly that I could barel use what was left to recover them. He chewed up almost every pillow and blanket we own. My blankets look like Charlie Browns Halloween costume! And then after being walked he would quickly run upstairs and poo on the floor. He also was an escape artist. He knew how to unlock the back door and slide it open and would take off. He thought it was fun for us to run after him around the block. Our neighbors, not so much. He also liked my youngest daughter too much. He would eat any clothes of hers that he could get his mouth on. Especially underwear, book bags, and her coats. So to say he cost us a fortune would be an understatement. But like I said,my husband had enough. My son didn’t want to spend any time training him so he had to go. Even though he was so destructive I still miss him. But if he got the attention. He deserves and the training, I’m glad he’s in a better place. So now I’m ready to buy a new couch and replace our twelve year old standard grade carpet that the builders put in! So can’t wait to hear how you did it and really love the color choice! Hopefully Pergo got better and doesn’t chip (we had it in our townhouse and it wasn’t as indestructible as they made it seems). Good luck! Thanks Kim! You should come over when I’m installing the flooring, it’s getting delivered sometime next week! The Pergo Outlast+ brand is specially designed for families that are rough on floors. Come over soon, I’m home full time now and you can check it out! I love dogs, but wow, yours sounds like a “special case” lol! I’m not sure how long I would last with that kind of behavior!! Not every dog is a good “fit” for a family, and somewhere out there…there is a good family for him. I learned that when I was fostering and rehoming dogs, Buddy’s issues only happen sometimes…so lately with the crazy storms and weather I think that has something to do with it. Hi, love your blog and home! I understand the whole stained carpet thing. I had two cocker spaniels, now only one who is 15. 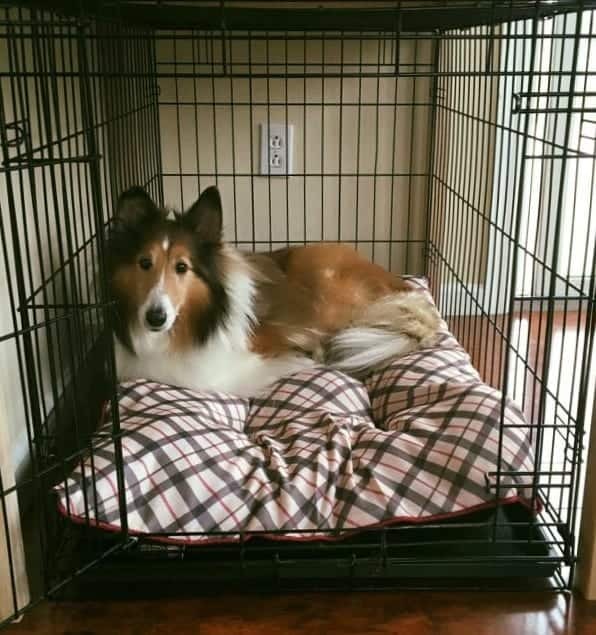 I never did the crate thing because he is a rescue and was in one for six years (another story) but when we leave him home alone we keep him in the kitchen where it’s easy to clean up. We also put a doggie diaper on him when we leave. So far, so good! He thinks he’s peeing on his favorite spot but (haha) we know he’s not! This makes a happier home for everyone. Good Luck! P.S. Pet Smart or Amazon sells them, I also save some $$$ by using baby diapers inside instead of buying doggie pads. Thanks Deborah! I think we may have to start doing this. Buddy is so fuzzy he’d probably need an XXXXL, but I think it might be fun to give it a try. For his birthday today, he may get diapers! (He turns 11 today!) Thanks for the advice. What’s frustrating is he did SOOOO well lately, and suddenly it’s gotten completely out of control!!! And Buddy normally likes hanging out in the crate (just like the picture), but not when we leave. He’s a complicated pup! I have a sheltie also! Buddy looks so cute but it seems he has an attitude haha! Tearing up carpet is a pain though and I feel your struggle.